Signed on Feb. 18, 2015. Wiggan was selected in the fourth round (34th overall) of the 2014 CFL draft and originally with the Stampeders on May 27, 2014. (Calgary) Wiggan played 14 regular-season games, starting each contest at defensive tackle. He recorded 10 tackles, one sack, one forced fumble and one interception. Wiggan recorded his first career interception in Week 21 at BC. He started both post-season games and had one tackle in the Western Final. (Calgary) Wiggan played 17 games and made 11 starts). He had 20 tackles including two tackles for loss, one special-teams tackle, two sacks and five QB pressures. Wiggan played offensive line at the end of the game in Week 2 due to injuries. He was on the one-game injury list for Game 17. He started both post-season games and had one tackle in the Western Final and one tackle and one quarterback pressure in the Grey Cup. (Calgary) Wiggan played 13 games (two starts) and had 12 tackles including one tackle for loss and also had two sacks. He played in the Grey Cup, recording one tackle and a knockdown. He was on the one-game injury list for Game 4 and the reserve list for Games 6 – 10. (Calgary) Wiggan played 16 games (one start) and had 13 tackles including a tackle for a loss, three sacks, a forced fumble and three special-teams tackles. He also had one kickoff return for eight yards. He was placed on the practice roster for Games 2 and 3. Wiggan played in both playoff games and had one knockdown. 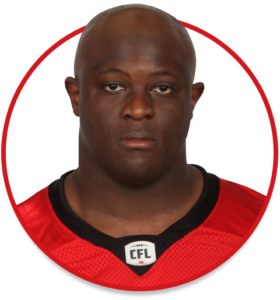 (Calgary) Wiggan attended training camp with the Stampeders before returning to university. With Queen’s in 2014, Wiggan made 36 total tackles and led the Gaels with 5.5 sacks. He led Ontario University Athletics with four fumble recoveries and also had 12 tackles for loss and one forced fumble. Wiggan was named a second-team OUA all-star. In 2013, he recorded 28 total tackles along with three pass breakups, 5.5 sacks and two forced fumbles and was named a first-team all-star for a second consecutive season. He was chosen to play in the 2013 East-West Bowl. In 2012, Wiggan led the Gaels with six sacks and also recorded 30.5 tackles including 6.5 tackles for loss. Wiggan attended high school at St. Michael’s College in Toronto and was part of the school’s city championship team in 2008. He was a history major at Queen’s.